The Baltic States of Estonia, Latvia and Lithuania are seeing rapid low-cost carrier growth, especially in their key market of Scandinavia. The very small or non-existent domestic markets in the Baltic nations means the local carriers are reliant almost entirely on international operations, where they must compete against foreign carriers. 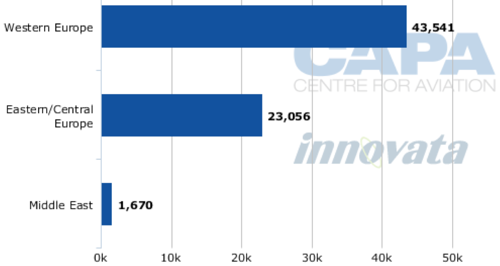 Like the rest of Europe, the most pronounced competition comes from LCCs. Estonian Air and airBaltic are the key carriers of the region but foreign budget carriers such as Ryanair, Wizz Jet and Flybe are increasing their presence in the Baltic market in order to tap into the burgeoning traffic volumes. Estonia’s national carrier, Estonian Air, is the leading carrier in the Estonian market with one third of the total system capacity. 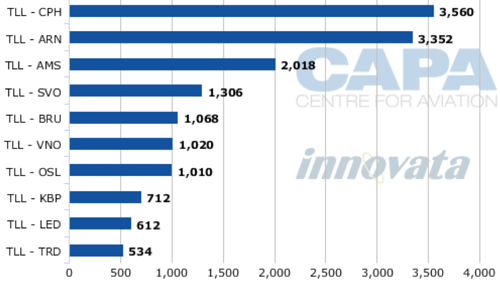 Estonia has the lowest LCC penetration rates out of the Baltic States with 34% of capacity provided by budget carriers. Aside from Estonian Air, Finnair and Lufthansa are the only other full service carriers with a significant portion of the Estonian market. Domestically Estonian Air holds 70% of the available capacity with the remainder held by Avies Air Company, which operates air taxi and business aircraft service. It is a privately owned carrier based in Tallinn operating domestically to Kardla (it also has a domestic network in Sweden). Estonian Air is 90% owned by the country’s Government with the remaining 10% held by the SAS Group. The carrier operates a small regional network from its Tallinn base, mainly through Western Europe, though it has a secondary Eastern focus. In Sep-2011, Estonian Air chairman Joakim Helenius announced the airline’s board confirmed plans to transform the airline into a network carrier by 2013, moving away from its predominantly regional focus to look more towards medium-haul routes. The airline operates a fleet of 12 aircraft consisting of four Boeing 737, two CRJ-900, four E-170 and two SAAB 340 aircraft. Estonian Air plans to phase out its 737s, in a fleet downsizing move favoured by other small European carriers; Poland’s LOT plans to consolidate its narrowbody fleet to only Embrarer EJets. Slovenia’s Adria Airways is evaluating the possibility to consolidate its fleet to just Bombarider CRJ aircraft. Estonian Air is in talks to acquire a further eight E-Jets from Embraer and leasing companies and is seeking a mix of E-175 and E-190 types. The airline is planning to operate at least 15 aircraft by 2015. The E-Jets would allow the carrier to expand its network and increase frequencies on destinations that do not require 737-size capacity. It expressed its intention to operate at least twice daily to its main European destinations, indicating it is seeing increasing traffic volumes and greater demand for increased frequency on its services between Estonia and Western Europe. These aircraft are not expected to arrive until 2013 at the earliest. Facing a large number of low-cost competitors, Estonian Air has undergone strategy adjustments in 2011 in order to strengthen its position in the Baltic market. Estonian Air CEO Tero Taskila told CAPA’s Airline Leader the airline has adjusted its onboard product and introduced a tiered fare structure in which its lowest fares are lower than LCC competitor Flybe Nordic. Latvia’s sole carrier, airBaltic, is a hybrid carrier, unlike the majority of national carriers around the world. This greatly contributes to Latvia’s high low-cost carrier penetration rate of 87%. airBaltic does not operate domestic services. The carrier flies from its Riga base to main city airports, not secondary ones, and has ancillary charges but also a business class product. As with Estonia, there is a large contingent of low-cost carriers in the Latvian market with Ryanair providing the most foreign LCC seats. The airline operates extensively through Western and Eastern Europe as well as some services to the Middle East. The carrier operates a fleet of 34 aircraft consisting of 14 Boeing 737s, two 757-200 eight Bombardier Q400 and 10 Fokker 50. It has only four Q400s on order. Since Dec-2011, airBaltic has announced intentions to increase frequencies across existing destinations; Vienna, Munich, Zurich, Amsterdam, Moscow Domodedovo and Billund will all see frequency increases to at least daily operation. airBaltic has also opened a new route, Riga-Dublin. Having at least a daily service is often the mantra in the industry, and it is especially wise in depressed economic times to build scale and achieve efficiencies rather than venture into new markets. The plan is especially wise given airBaltic’s weak financial condition. The last half of 2011 saw airBaltic threaten to lay off half of its employees and cancel hundreds of flights a week in a cry for capitalisation before the Government stepped in and acquired Baltic Aviation Services' (BAS) 47.2% stake in the carrier, bringing the Government’s stake to 99.8%. A management change coincided with the capitalisation. Latvia now joins a number of European countries seeking a strategic investor for a national airline with weak financials. Lithuania has no locally based carriers operating to/from Lithuania since national carrier Lithuanian Airlines ceased operations in 2009 owing to rising debt and intense competition with airBaltic. Lithuanian’s exit saw the market become flooded with LCCs as the country’s LCC penetration rate increase from 26% to today’s 66%. 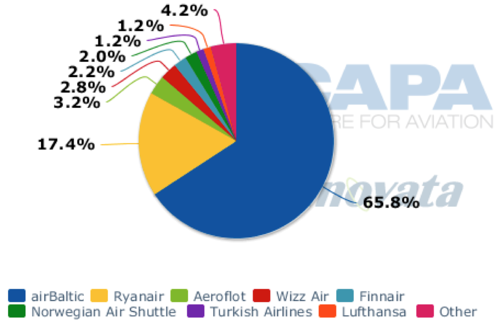 Ryanair became the leading carrier in Lithuania, offering almost half the available capacity to/from the nation, followed by by Wizz Air and airBaltic. 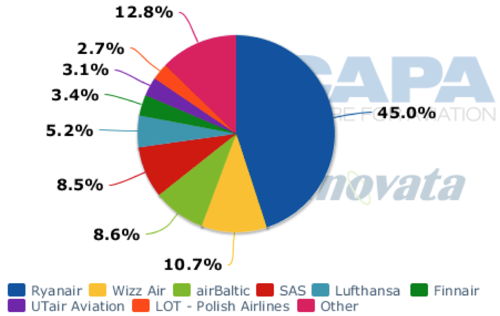 Lithuania does still have a number of full service carriers operating into the nation, including SAS, Lufthansa and Finnair. Like Latvia, Lithuania does not have domestic air links. Scandinavia is the primary market for both Estonian Air and airBaltic, and is also a growing LCC market with a number of LCCs currently operating on, or planning to operate, services between key points. Of Estonian’s top 10 routes, Scandinavian destinations of Copenhagen and Stockholm lead as first and second, respectively, with Oslo and Trondheim ranking seventh and 10th. Estonian Air cooperates with SAS Scandinavian Airlines, and so operates into SAS’ key hubs, feeding traffic from the Baltic States. Estonian is the only operator between Estonia and Denmark, and is the dominant carrier from Estonia to Norway and Sweden where it faces competition from Ryanair, Norwegian Air Shuttle and Flybe Nordic. Scandinavian destinations also appear in airBaltic’s top 10 destinations, with Copenhagen, Oslo, Stockholm and Helsinki ranking from fourth to seventh, respectively. Currently airBaltic is the only operator between Latvia and Denmark, however, from May-2012 Norwegian Air Shuttle will enter into the market. 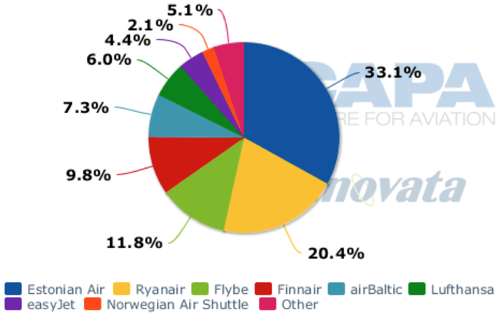 From Latvia to Norway and Sweden the level of competition is higher with Ryanair, Norwegian and Wizz Air also operating. Despite this, airBaltic is still the leading carrier on these services. Aside from links to the Latvian capital, Vilnius, Estonian Air and airBaltic also share a number of other routes in their main markets, including Moscow Sheremetyevo, Kiev Boryspil and Saint Petersburg. Despite having no national carrier, Lithuania is still well served by others, particularly low-cost airlines on services to Scandinavia. SAS is the only operator between Lithuania and Denmark, however, it operates services between the southern-most Baltic nation and Norway along with Ryanair, Norwegian and from May-2012, Wizz Air. Ryanair and Sweden’s Skyways operate between Lithuania and Sweden. Ryanair and Wizz Air are set to increase their Baltic networks in European summer 2012. Wizz Air, which currently operates to 13 destinations from Vilnius, announced on 08-Feb-2012 plans to launch Vilnius-Stavanger on 27-May-2012. In Lithuania, Ryanair has a base at Kaunas, the country’s second largest city. From here it operates four services to Scandinavia, but mainly to its other hubs in Western Europe. 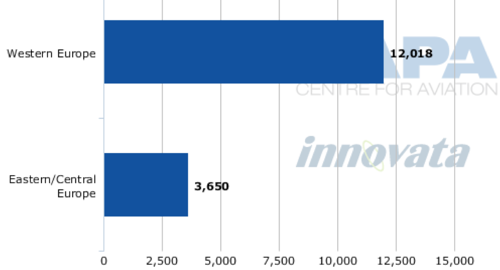 It plans to launch 13 new services from the Baltic region in summer 2012. All of Ryanair’s new routes will open the city-pairs for the first time, except for Tallinn-Frankfurt (Ryanair will fly to Frankfurt Hahn whereas Lufthnsa uses Frankfurt am Main). Despite the growing low-cost links from Tallinn, Estonian Air does not compete directly with LCCs to a great extent. airBaltic also does not compete directly with LCCs to a great extent either, with only eight of its 60 routes also operated by LCCs. A hybrid business model can often provide opportunities to compete against LCCs like Ryanair and full service carriers like Estonian Air, but airBaltic is currently experiencing structural problems limiting its ability to effectively compete. 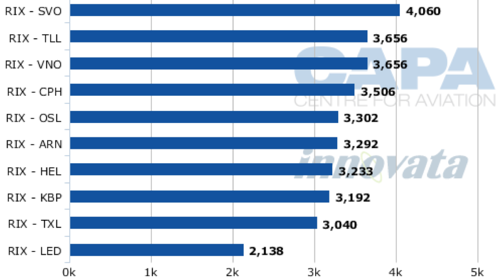 LCC penetration rates will continue to climb in Estonia and Lithuania, where the rates have been rising steadily, especially in Lithuania given the country’s absence of a local carrier. National carriers in the Baltic States have yet to prove the existence of a sustainable position that can provide assurance for future longetivity. Estonian Air is small while airBaltic is in financial troubles and financial troubles previously forced Lithuanian Airlines out. This matter is topical, with Spanair and Malev having collapsed and a number of other small European carriers awaiting a turnaround or market exit. One fate that is certain is the one where LCCs will continue to grow and require, like elsewhere in the world, greater competitve response from incumbent carriers.